87 Iroc-z 305 TPI, 5 Speed G92 Bose stereo = I have the panels. am i the original owner no, was the previous owner the original owner no. My 87 Iroc didn't have the hush panels when we got it, so I added them. It didn't have any floor lights at all though, and its not a bose car. When I added them I didn't have to drill any holes or anything like that. I'm fairly certain the car had the panels from the factory, and that a previous owner/mechanic removed them cause he was an idiot. Also, every thirdgen I've ever owned has had the diagnostic connector cover. Along with just about every GM car I've ever owned. Another side note is that there are MANY different hush panels used on thirdgens between 82-92 and most of them aren't interchangeable. 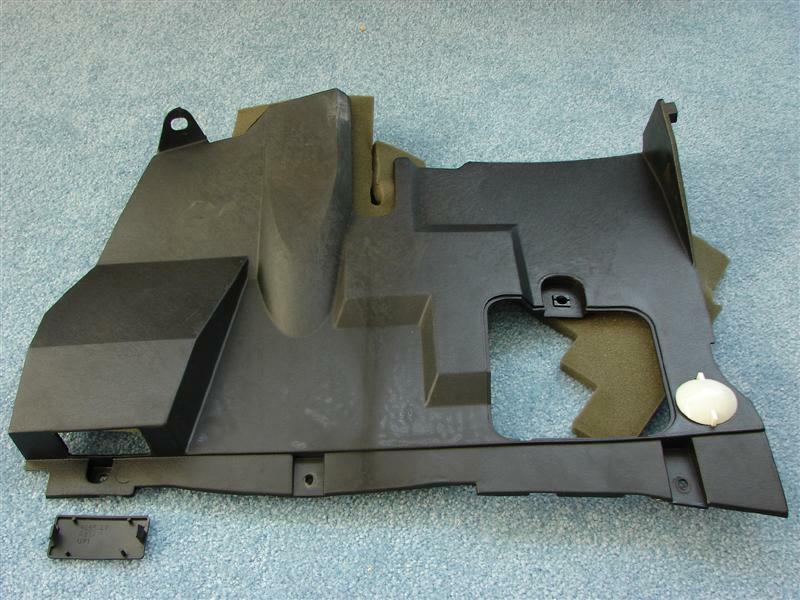 For example, a drivers side panel from an 82 Z28 fit my 83 Coupe fine, but wouldn't come close to fitting in my 87 Iroc, but the drivers side panel out of an 86 Firebird fit the Iroc like a glove. 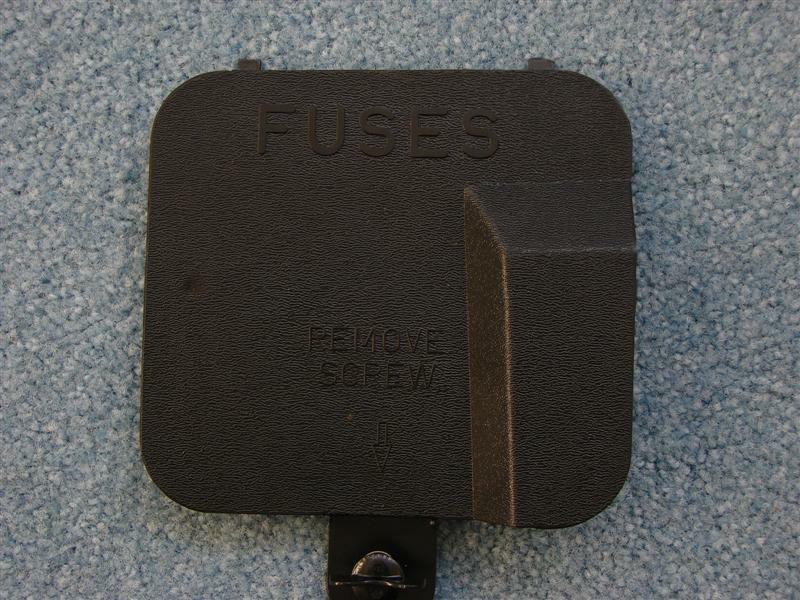 Also, the fuse block covers are different from some years to others. Do you have the under dash lights then? When I had the hush panels and the bose kick panels the light on the pass. side would rub against the panl and mlt the carpet. I know that most people are speaking of '87 cars, but my '89 IROC-Z has the "form-fitted, black plastic cap" with 'DIAGNOSTIC CONNECTOR' printed on it that Willie spoke of. My car is a 350 car. Is there any word yet on how to tell whether or not these cars were supposed to come with the plastics? My car has them but I'm restoring it, so I don't want to lose points for having something that isn't supposed to be there. My car has them but I'm restoring it, so I don't want to lose points for having something that isn't supposed to be there. You won't lose points for having them. I lost points for not having them. Most cars do have them but some don't, from the factory! My wasn't supposed to have them for whatever reason, but since most cars have them, the judges figured I was missing interior components. My car also came without them from the factory. Its the L98, IrocZ, No Bose, Non A/C, pretty much un optioned car. I mentioned the non a/c thing because with the non a/c you have the underdash vents which they made different covers for. It took me a while but I was able to find covers that fit and had the openings for the vents. I was on the team that judged you car Scott. The "third-gen" expert on our team said they were missing, I initially did not subtract any points until he pointed out the panel issue. I had an 87 IROC w/350, Bose and leather and I don't think it had panels either. However, mine went thru a number of owners before I had it. Regardless, it was the nicest 3rd gen there. Last edited by TA76; 08-19-2004 at 01:56 PM. The only way we're really going to find an answer on this is with RPOs. Unless you can find someone that was on the thirdgen design team. You'd think the judges would need to have a more thorough knowledge of 3rdgen options. Are RPO descriptions this detailed? There are two RPO codes that I have found, as to whether they pertain to the underdash panels I can't say for sure. In earlier models, there was a BS1 code for acoustical insulation (also known as Quiet group option). In later years there was another RPO code, it was B3E and was for the Noise group option. Have not yet seen anything specifically pertaining to underdash (knee bolster) panels in either the camaros or firebirds. Now what would put such a suspicious thought like that in your head? Well, I'd say that this forum is probably the place to find the most knowledgable answers, however, we still haven't answered this one. The judges can't know everything. I met the "expert" that took the points off. He has a white LS1 thirdgen convertible. It's been seen on these boards and we support his company for 3rd gen parts. Again, if most cars have these, then it would be obvious that a car without them is "missing" them. That's why I originally posted this thread. I need to know! I actually found the 87 IROC-Z I've been looking for all these years, 4 1/2 to be exact! (Whoo Hooo, and thanks to SM and 87 B4Z TPI 5Spd for helping make it possible!) I will have it soon, but I already know that it has no hush panels. It's a Van Nuys L98 1SC (without D42) car. Basically it has every option except BOSE, cargo cover, hatch locking storage cover, and leather seats. It's an incredibly documented and near mint 67,000 mile original except for PROM chip and stereo/amp/speakers. So here's another untouched car without them. There has to be an RPO or reason for it because any model could have them or not have them. For those who don't have the lamp group option, check the under dash harness right where the hush panels screw in. I think you will find the sockets for the courtesy lamps taped up there. Thats where I found them on my car. All I had to do was add the bulbs (194) and snap them into the hush panels! My 86 has the BS1 code with underdash panels. My 92 RS has the panels without BS1 or B3E. It's possible they were added into the 92 though. Time to dust this off, can you identify the years these came from? Pics will be posted in a few. Well I thought it would be a combination of TR9 (aux lighting) and BS1 (quiet sound group). But BS1 wasn't available in '87. Anyway my '84 Z28 has the hush panels on both sides. The car has TR9, YE2 (radio), 60C (custom cloth interior). Just for the record. I've got an 87 Iroc with a 350 L98. Has the bose, no hush panels, no lights, no brackets. ALDL connector on the right in the pic. Carpeted center console. It did, however, have the u-clips under the dash for the panels to be installed. I found a passenger panel and bolted it right up. Looks great. no spot for a courtesy light though. That's ok, because like I said, I don't have any. Is the one on the bottom from a bird? my 87' sport coupe is a non-bose car with the interior lighting package, never had the hush pannels. and i've known the car since new. So far it seems that we've never been able to make a solid determination as to specifically what cars get them and what don't. I didn't go back and re-check every post, but from those that I did check out, it seems that all of the cars without the hush panels were Van Nuys cars. I know there are other differences between Van Nuys and Norwood cars, and perhaps this is another. We've ruled out that it's a 350 issue, and we've ruled out that it's a Bose issue. We haven't ruled out specific RPO codes, interior packages, or assembly plant. This is extremely interesting for a thirdgen geek like me. My 1990 350 Iroc with the Bose system did not come with them from the factory. The reason being with the Bose you can't open the fuse cover. I know without a shadow of a doubt that 1987 and 1988 IROC-Z's with the 350 did not come originally with the hush panels. I do not know the reasoning. Weird. Like your car has, the courtesy light bulbs are mounted on plastic "L" brackets on these cars only. My guess is to amplify the great sound of the 350. My 85 IROC, which was originally an LG4 and highly optioned (though it was equipped with an AM radio), had the hush panels. Norwood car. My '88 sport coupe didn't have the hush panels when I bought it. I'm not the original owner, though. It has the L brackets for the lights and the little cap for the diagnostic connector so I'm pretty sure it never had them. In addition My RS was made in Van Nuys, maybe it is connnected to rpo IP2?? Was there a resolution on this? Axle/Gears: 3.23 posi, ones that rotate! I don't ahve a good answer for why or why not the hush panels were in some cars and not others, or for what year(s) they may have been included or excluded. I also do not know of any RPO time code that explicitly called for them to be installed on a car. I am the original owner of of 1982 Z28 with the Cross Fire TBI. I have hush panels on both the driver's and passenger's sides. I did not have the BS1 option. I do have the TR9 " Auxiliary Lighiting" and 79C "Custom Cloth Bucket Interior" I also have the YE4 Raido option, which is the stero radio with the cassette player. Speakers on this car are under the dash, not down by the driver's feet. The car was built in the Van Nuys plant. The top photo looks like my driver's side hush panel from the 1982 Z28. I have no idea how many model years this panel was used for. But what is the RPO for the mold, etc. Just wanna thank willie. 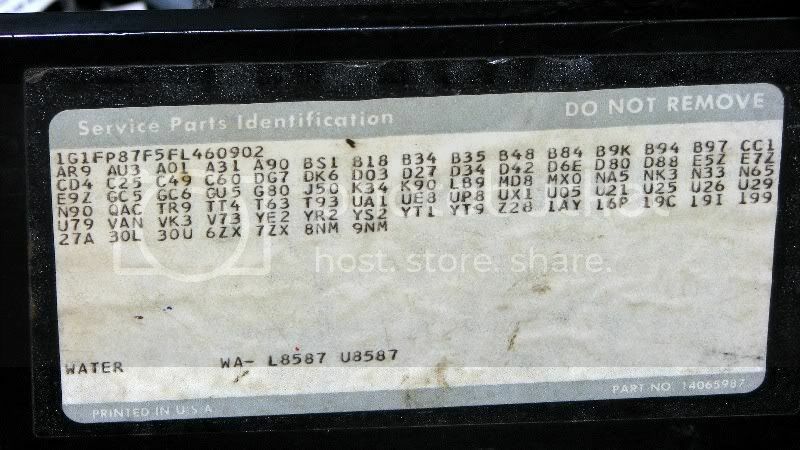 I saw one of those little rectangular peices floating around in my 87 firebird that i recently purchased, and for the life of me i couldnt figure out what it was off of, or where it came from!!! But all is well now. My '83 Z28 is a Van Nuys car with Custom Cloth Interior,which included RPO-BS1 quiet sound group,RPO-TR9 lamp group and RPO-B48 luggage compartment locking storage/deluxe trim(although this most likely has nothing to do with the hush panels).She has the hush panels on both sides with the kick panel lights installed in them and the snap on ALDL cover.The sound group is the most likely candidate,to me,for the panels being there.And the interference with the BOSE kick panels for them not being there.Maybe the Bose equipped cars had additional sound deadening against the firewall.This sounds like another GM using when it's available not worrying when they weren't. My 350 87 didn't have hush panels either. I didn't like the wiring hanging down from the pass side, so I went and got a set out of an 88 AC car at the junkyard. Well, two 88 AC cars. One's heater core exploded during a fire, so the pass panel was unusable. I had the little brackets, but removed them to put the lights in the hush panels. You have a rear wiper with louvers? I have the defroster with mine, but no wiper. I have an 88 Camaro Sport Coupe. I did not have the panels or the courtesy lights. However, I inspected under the dash to find a white wire and orange wire going to a bulb holder. I put in a bulb and noticed it lit up when I opened the doors. This courtesy light wiring was installed just hidden with a mash of wires under the dash. I bought the hush panels on e-bay and now I am set. Seems to me your car probably came that way from the factory and did not have the option. Some people have upholstered center consoles and rear hatch areas as well. These were all options. If it matters- I have an 88 T/A L03 with both panels. It has the Performance Stereo Bose, but the speakers aren't in the kicks. well I have no hush panels in my '85 Z28 with the LB9/700r4. It always felt as if there was supposed to be a cover there. You can see all the wires and the light bulb hanging down, etc. If there is a hush panel available for my car I would love to have one. I had an 85 Z back in 87--was fully loaded inside but no pwr mirrors, LG4 car. I had the hush panels in it. bought it from the dealer--I was the 2nd owner. Original owner was a mechanic at the same dealer so I'm pretty sure car was unmolested--plu it was only 2 yrs old. I also had an 85 base Camaro w/the 4 cyl. Only options were rear defrost, auto and a/c. Car definitely didn't have the hush panels--had the metal brackets for the interior lights. also had a cap that slide onto the diagnostic port. The Z had a cap on the hush panel for the port. my 85Z does have them and its an alright optioned car. my car is a van nuys car.